53Mn is copiously produced in core collapse supernovae, whereas our early solar system has a relative absence of 53Mn. ¶ Additionally, carbonaceous chondrite anhydrous minerals (CCAM), including CAIs and chondrules, are significantly enriched in 16O compared to Earth. This may point to stellar-merger core temperatures having exceeded 100 million Kelvins, where helium burning (triple-alpha process) begins. Helium burning would also have enriched the Sun and its (4,567 Ma) stellar-merger debris disk in 12C as well as 16O; however, 12C enrichment is difficult to discriminate from mass fractionation. Oxygen-16 enrichment has the advantage of having two other stable isotopes to compare with (17O and 18O), thus washing out the effects of mass-dependent fractionation. ¶ Carbonaceous chondrite anhydrous minerals (CCAM), including CAIs and chondrules, plot with a slope near 1 on the 3-oxygen-isotope graph of δ17O vs. δ18O. A slope of 1 represents complete mixing due to rapid condensation from a vapor phase. (The anhydrous modifier is significant since any subsequent aqueous alteration, forming hydrous minerals, would occur slowly, allowing mass fractionation which would move the processed material off of the slope of 1.) By comparison, complete fractionation plots with a nominal slope of 1/2, where 17O is almost exactly half as fractionated as 18O with respect to 16O. The terrestrial fractionation line (TFL) plots with a slope of .52, nominally 1/2. 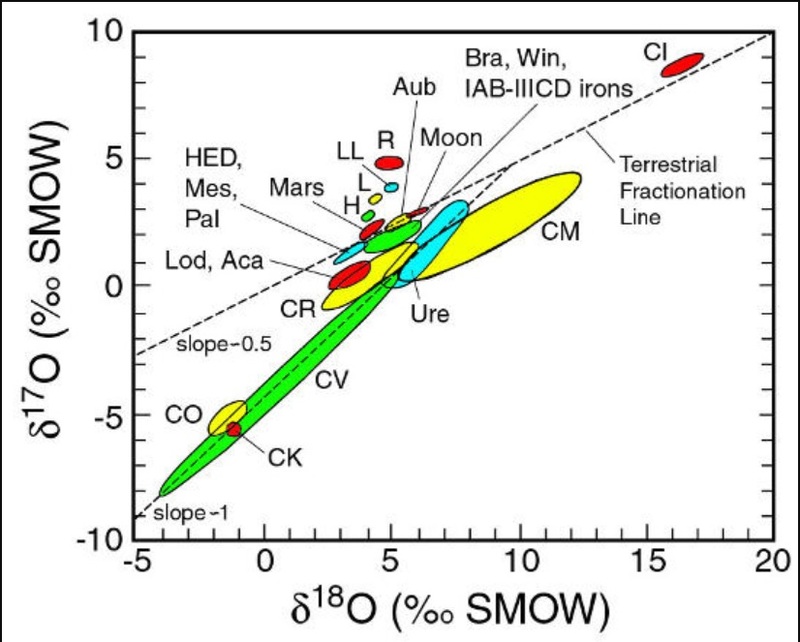 ¶ The Mars fractionation line lies slightly above the TFL on the 3-oxygen-isotope plot, indicating a slight 16O enrichment in terrestrial materials compared to Martian meteorites. By comparison, most CCAM materials condensed from the stellar-merger debris disk are much more enriched in 16O than Earth, causing them to plot significantly below and to the left of most terrestrial materials, indicating lower δ17O (plotting below the TFL) and lower δ18O (plotting to the left of most terrestrial materials). A solar system origin of the SLRs and stable isotope enrichments eliminates the necessity for a nucleosynthesis event close to solar formation, potentially removing several ad hoc variables. Both the fortuitous proximity and fortuitous timing of nearby nucleosynthesis injection is eliminated by using the first condensates of the stellar merger (CAIs) to define t = 0 for the solar system. And if CAIs with canonical 26Al/27Al concentration were condensed from polar jets squirting from the merging stellar cores, then the symmetry of the binary spiral-in merger may explain the canonical 26Al/27Al homogeneity, which otherwise requires ad hoc homogenous mixing of material injected from a nearby supernova or asymptotic giant branch (AGB) star. And, the ad hoc dilution factor of nearby nucleosynthesis is effectively eliminated, if all but a sprinkling of pristine presolar grains are stellar-merger debris. And finally, the late nucleosynthesis event would be scaled back by the ‘dilution factor’, where the dilution factor is the ratio of late remote input by a supernova or AGB star to the diluting background gas. A stellar merger also eliminates the dynamic disruption of an energetic event close to solar formation on the gravitational collapse of a Jeans mass. So far, no modeling of local Galactic chemical evolution, core collapse supernovae, AGB stars and/or neutron star mergers can provide the recipe of our early solar system, particularly for f-process radionuclides which still can not be well modeled. A binary spiral-in merger, which would certainly engender a degree of nucleosynthesis, would eliminate at least 3 variables of the early solar system in the form of timing, proximity and dilution factor of a fortuitous event. The bullseye symmetry of a defining event (versus the offset asymmetry of a fortuitous event) also eliminates the improbable outcome of homogenous mixing (canonical 26Al/27Al) of external input from a high-energy event into a delicate Jeans mass.